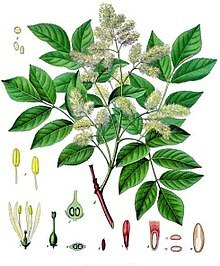 Eskiætt (fræðiheiti: Fraxinus) er ættkvísl blómstrandi trjáa af smjörviðarætt (Oleaceae). Hún er með um 45–65 tegundir af meðalstórum til stórum trjám, yfirleitt lauffellandi, þó örfáar tegundir í heittempruðum svæðum eru sígræn. Ættkvíslin er útbreidd um mestalla Evrópu, Asíu og Norður Ameríku. Tegundunum er raðað í deildir eftir phylogenetic analysis. ↑ „Fraxinus“. World Checklist of Selected Plant Families. Kew Royal Botanical Gardens. Sótt 16. apríl 2016. ↑ „Fraxinus“. Altervista Flora Italiana. Sótt 16. apríl 2016. 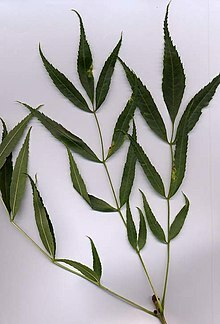 ↑ „Fraxinus Linnaeus, Sp. Pl. 2: 1057. 1753“. Flora of China. bls. 273 – gegnum 衿属 qin shu. ↑ Philips, Roger (1979). Trees of North America and Europe: A Guide to Field Identification, Revised and Updated. New York: Random House. ISBN 0-394-50259-0 . Snið:Oclc. ↑ „Genus Fraxinus“. US Department of Agriculture. Sótt 21. ágúst 2016. ↑ „Systematics of Fraxinus (Oleaceae) and evolution of dioecy“ (PDF). Sótt 28. ágúst 2016. ↑ Hinsinger, Damien Daniel; Basak, Jolly; Gaudeul, Myriam; Cruaud, Corinne; Bertolino, Paola; Frascaria-Lacoste, Nathalie; Bousquet, Jean (21. nóvember 2013). „The Phylogeny and Biogeographic History of Ashes ( Fraxinus, Oleaceae) Highlight the Roles of Migration and Vicariance in the Diversification of Temperate Trees“. PLOS ONE. 8 (11): e80431. doi:10.1371/journal.pone.0080431. PMC 3837005. PMID 24278282 – gegnum PLoS Journals. ↑ „Species Records of Fraxinus“. Germplasm Resources Information Network. United States Department of Agriculture. Sótt 22. febrúar 2010. ↑ „Fraxinus L.“. ITIS Standard Reports. Integrated Taxonomic Information System. Sótt 22. febrúar 2010. Þessari síðu var síðast breytt 24. mars 2019, klukkan 22:14.